Year 2013 is expected to bring a lot of joy and cheer to the trading community. Swift policy action by the government and strong FII inflows which are expected to continue will push the BSE Sensex past 20,000 this coming year, say analysts. Dinesh Thakkar, Chairman and Managing Director of Angel Broking says “From the current level, I expect the Sensex to see an upside with a target of 20,300 in the next 12 months, hitting an all-time high between April 2013 and Diwali,” he said, adding that there were possibilities for further upsides in FY2014 arising out of improvement in earnings growth outlook. From July-August 2012, things started looking up for Indian markets, government has taken various steps towards reforms like raising diesel prices, hiking limit of FDI in retail and aviation, proposing SEB reforms, direct transfer of cash subsidy and divestment. FII has also appreciated this policy reforms and cheered the market by posting handsome rally, FII in flows are reaching record levels of $18.4 billion in YTDCY12. “Divestment targets and execution of the promised equity sales and finally clarity on foreign investments into Indian enterprises by the government should add more fuel to the rally,” says Kanvinde of Right Horizons. 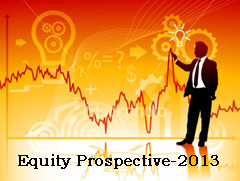 Overall Equity will beat all other asset class in 2013 so it is advisable to invest in equity for 2013. However, with all the optimism around, analyst still suggest being cautious while selecting stocks and going for quality names. A key learning in the market is that a disciplined approach should be followed while investing rather than trying to time the market perfectly by waiting for all the bad sentiments in the market to reverse. How to analyze the fundamentals of the company?